Zimnat, one of the country's leading insurance groups, yesterday rewarded students from the Harare Institute of Technology who took part in a hackathon that the company organised. A hackathon is a competitive event where people work collaboratively in groups on software or even hardware projects with the aim of creating a functioning product by the end of the event. Twelve students from the institute's Electronic Commerce and Financial Engineering departments took part in the event, competing in four teams. Zimnat Group chief executive Mustafa Sachak presented the winning team, which was comprised of John Sakala, Amen Mushanyuki and Philip Mashingaidze, with shields and prize money of $400 per person. The team that came second, made up of of Itai Zulu, Susan Chikerema and Augustine Mukumba, was presented with prize money of $200 per person. Members of the third placed team were each given $100, while those in the fourth placed team each received $50 each. Speaking at the award ceremony, Mr Sachak said Zimnat was excited and inspired by the calibre of presentations from the Harare Institute of Technology students. He said he was confident there would be further opportunities for collaboration between Zimnat and the institute. The hackathon was convened by the Zimnat Group, which is comprised of Zimnat Life Assurance, Zimnat General Insurance, Zimnat Microfinance and Zimnat Asset management, in partnership with the Harare Institute of Technology School of Business and Management Sciences. School of Business and Management Sciences Dean Willard Gwarimbo expressed his commitment to a continued partnership with Zimnat, which, he said, ultimately aimed to strengthen the economy and nation at large. 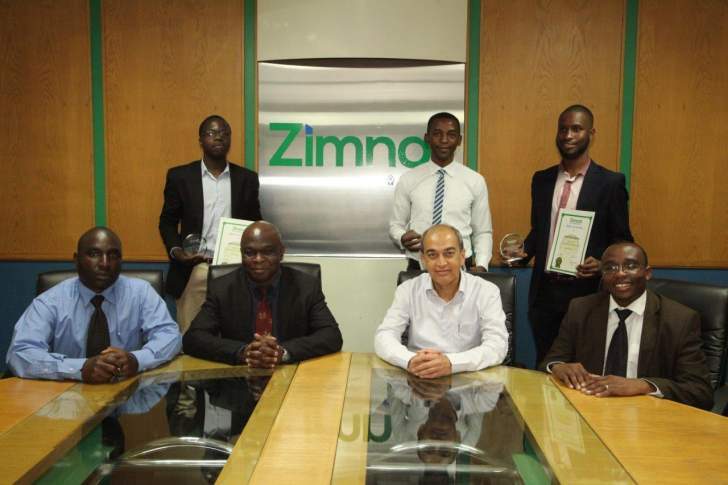 The winners of the hackathon (standing left to right) Amen Mushanyuki, John Sakala and Phillip Mashingaidze with hackathon organisers (seated left to right) Norman Chifamba, Willard Gwarimbo, Mustafa Sachak and Tafadzwa Zimucha.